NEW! 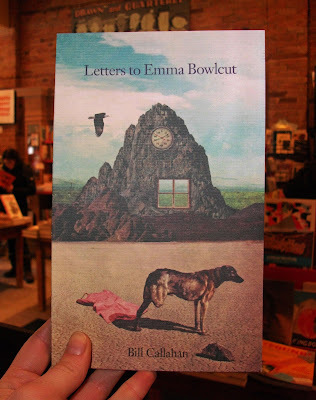 Letters to Emma Bowlcut is a handsome novelette from handsome American musician Bill Callahan of Smog. The story is composed of letters written by an unnamed man to a woman with light sucking hair he sees at a party and becomes strangely attracted to. The surrealist cover is printed on satisfyingly embossed card stock. You've got to feel this.